Lifted City! 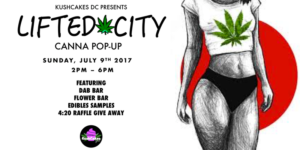 A Canna Pop-Up featuring DC’s TOP Vendors! Come enjoy a Sunday Funday in a 420-friendly environment for the Canna Community! During this Event at 4:20PM each ticket holder will automatically be entered for a chance to be a winners! Prize Items include: KushcakeDC’s Sample Pack and other various prizes!! Live DJ, Dab Bar, Flower Bar, Edibles Tasting, Infused Mimosa Bar AND MORE!